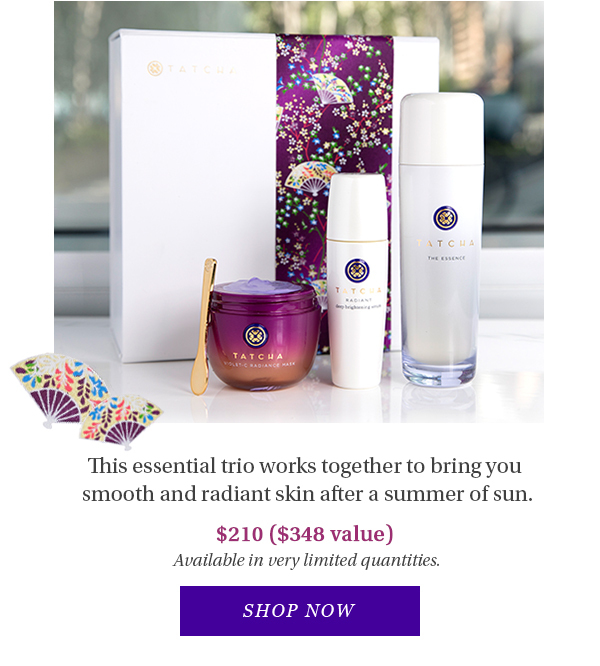 TATCHA is offering a limited edition 3-piece Brightening Set ritual for softer, smoother, more radiant skin, featuring brightening botanicals and anti-aging Japanese superfoods. Perfect after a summer of sun, these products work ideally together for instant and long term results. For daily use, The Essence is a transformative fluid of 98.7% Green Tea, Rice and Algae that softens, plumps and floods skin with hydration, making all your skincare work better. Follow with the Radiant Deep Brightening Serum of Asian botanicals including Jujube and Licorice Root extracts that visibly improve hyperpigmentation, dark spots and uneven skin tone. 2-3 times a week, pamper yourself with the Violet-C Radiance Mask, a creamy rinse-off treatment packed with brightening Japanese beautyberry, 2 types of Vitamin C and AHAs from 7 fruits to unveil softer, brighter skin with each use, with none of the irritation. Ideal for all skin types.